In the beginning, life was small. For billions of years, all life on Earth was microscopic, consisting mostly of single cells. Then suddenly, about 570 million years ago, complex organisms including animals with soft, sponge-like bodies up to a meter long sprang to life. And for 15 million years, life at this size and complexity existed only in deep water. Scientists have long questioned why these organisms appeared when and where they did: in the deep ocean, where light and food are scarce, in a time when oxygen in Earth's atmosphere was in particularly short supply. 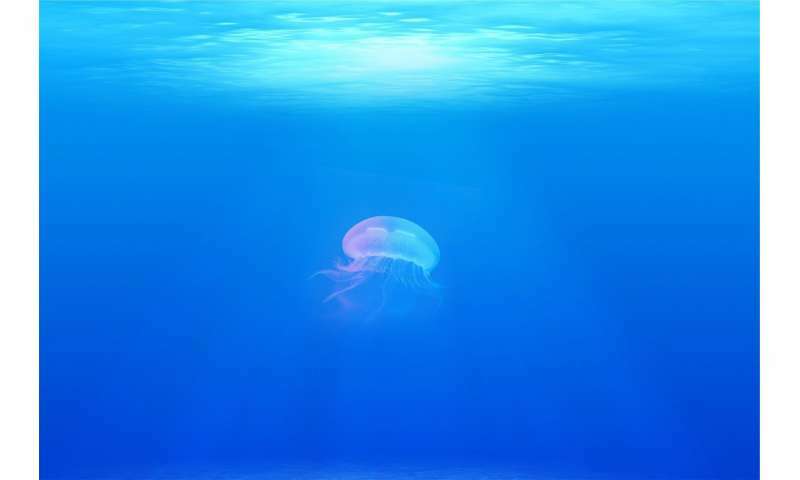 A new study from Stanford University, published Dec. 12 in the peer-reviewed Proceedings of the Royal Society B, suggests that the more stable temperatures of the ocean's depths allowed the burgeoning life forms to make the best use of limited oxygen supplies. All of this matters in part because understanding the origins of these marine creatures from the Ediacaran period is about uncovering missing links in the evolution of life, and even our own species. "You can't have intelligent life without complex life," explained Tom Boag, lead author on the paper and a doctoral candidate in geological sciences at Stanford's School of Earth, Energy & Environmental Sciences (Stanford Earth). The new research comes as part of a small but growing effort to apply knowledge of animal physiology to understand the fossil record in the context of a changing environment. The information could shed light on the kinds of organisms that will be able to survive in different environments in the future. "Bringing in this data from physiology, treating the organisms as living, breathing things and trying to explain how they can make it through a day or a reproductive cycle is not a way that most paleontologists and geochemists have generally approached these questions," said Erik Sperling, senior author on the paper and an assistant professor of geological sciences. Previously, scientists had theorized that animals have an optimum temperature at which they can thrive with the least amount of oxygen. According to the theory, oxygen requirements are higher at temperatures either colder or warmer than a happy medium. To test that theory in an animal reminiscent of those flourishing in the Ediacaran ocean depths, Boag measured the oxygen needs of sea anemones, whose gelatinous bodies and ability to breathe through the skin closely mimic the biology of fossils collected from the Ediacaran oceans. "We assumed that their ability to tolerate low oxygen would get worse as the temperatures increased. That had been observed in more complex animals like fish and lobsters and crabs," Boag said. The scientists weren't sure whether colder temperatures would also strain the animals' tolerance. But indeed, the anemones needed more oxygen when temperatures in an experimental tank veered outside their comfort zone. Together, these factors made Boag and his colleagues suspect that, like the anemones, Ediacaran life would also require stable temperatures to make the most efficient use of the ocean's limited oxygen supplies. It would have been harder for Ediacaran animals to use the little oxygen present in cold, deep ocean waters than in warmer shallows because the gas diffuses into tissues more slowly in colder seawater. Animals in the cold have to expend a larger portion of their energy just to move oxygenated seawater through their bodies. But what it lacked in useable oxygen, the deep Ediacaran ocean made up for with stability. In the shallows, the passing of the sun and seasons can deliver wild swings in temperature—as much as 10 degrees Celsius (50 degrees F.) in the modern ocean, compared to seasonal variations of less than 1 degree Celsius at depths below one kilometer (.62 mile). "Temperatures change much more rapidly on a daily and annual basis in shallow water," Sperling explained. In a world with low oxygen levels, animals unable to regulate their own body temperature couldn't have withstood an environment that so regularly swung outside their Goldilocks temperature. The Stanford team, in collaboration with colleagues at Yale University, propose that the need for a haven from such change may have determined where larger animals could evolve. "The only place where temperatures were consistent was in the deep ocean," Sperling said. In a world of limited oxygen, the newly evolving life needed to be as efficient as possible and that could only be achieved in the relatively stable depths. "That's why animals appeared there," he said. What caused the mass extinction of Earth's first animals? Good effort but not very convincing. We know that the early fossil record is spotty and biased, and the soft body preservation of Ediacaran animals is in extraordinary locales. To go from there to construct temporal, ecological patterns is fraught with confounds.